Have a laugh with a juggling and joking jester. Jesters are just one of the acts that we would recommend for a medieval themed fun day, but we have an array of characters available to suit any theme. Stilt Walkers in particular are an eyecatching act to book at your event. 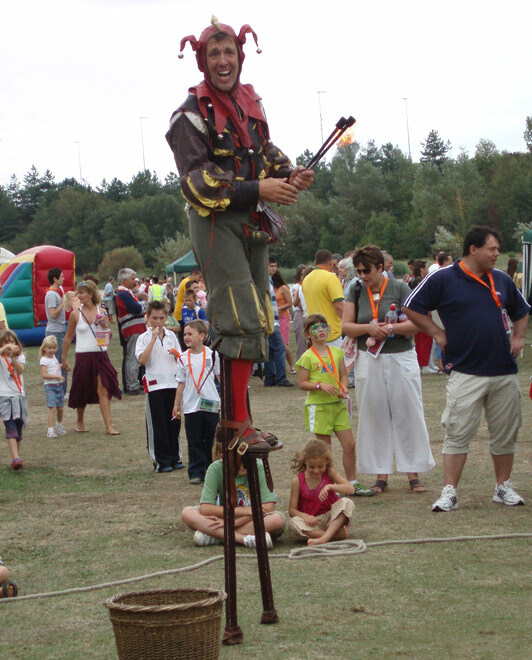 From Jugglers, Fire Eaters to Disney Charcters, anything on stilts is worth stopping and watching! Peterkin The Fool is one of our favourites. He is a Jester of International repute and can offer a show with an authentic flavour of the sixteenth century, either on stilts or on foot. Seriously silly and genuinely authentic he will bring a giggle and guffaw to any gathering. I just wanted to say a huge thank you for your outstanding contribution to the enormously successful family fun day. The event was a great success and that was thanks in no small part to you both. We gad unprecedented attendance figures and all forms of entertainment provided by ACF were of the utmost quality and of course fun!! I will not hesitate to recommend ACF to my colleagues and clients in the future and I very much look forward to working with you again.